of areas with a high concentration of Kurdish residents. The Kurdish people became famous to the outside world in 1991, when TV broadcasts showed nearly three million of them fleeing Saddam Hussein’s army during the Gulf War. For weeks they suffered in the mud and freezing conditions, without adequate water, food, and shelter. After they returned to their homes with protection from the US Army, the Allies set up air patrols to protect them from Iraqi government forces. These patrols lasted for over a decade while Iraqi Kurds set up their own regional government, a remarkable achievement given the Kurds’ political history. The Kurds’ history has been characterized by suffering on a grand scale, and often. While history records numerous pogroms and massacres dating back centuries, the 20th century was by far the worst. Kurds in Iran are repressed by the government and suffered disproportionately during the Iran-Iraq war. In Syria, thousands of Kurds do not have citizenship, and virtually all are marginalized economically and prohibited from promoting their culture and language. Use of the Kurdish language is banned in schools and publications. In Turkey, the government has cracked down on certain Kurdish groups, especially since the 1980s, when some Kurds started an organized resistance movement and a violent campaign for a separate Kurdish state. Thousands have been killed, and thousands more have fled west to Istanbul or Europe. In Iraq, Saddam Hussein’s government attempted to wipe out the Kurds in the 1980s, dropping poison gas on them from the air. It victimized many more in untold ways. Kurds were certainly not its only victims, but they suffered intensely under Saddam’s regime. Evidence suggests the Kurds’ closest predecessors were the Medes, the people mentioned in both the Old and New Testaments. Medes are mentioned ten times in the Old Testament, often alongside their neighbors, the Persians. They were politically and militarily important. Some Medes are mentioned in Acts as being present at Pentecost in Jerusalem. They are listed as one of the peoples who heard the disciples, through the power of the Holy Spirit, speaking in their own language. Despite the prominence of Islam in Kurdistan, today there are still thousands of Christians there who trace their descent through many centuries of church history, a fact of which they are proud. They include Chaldean Catholics, Assyrian Orthodox (known as “Nestorians” until the late 19th century), Syrian Orthodox, and Armenian. They comprise less than 10% of the population. Like the Jews who formerly lived in the area, they speak Syriac (neo-Aramaic) as their mother tongue. Most also speak Kurdish and/or Arabic. In most cases they do not refer to themselves as ethnically Kurdish, except perhaps if talking to an outsider who does not understand the complexities of local ethnic identities, or for political purposes. 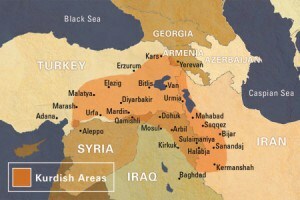 Nevertheless, the term “Kurdish Christians,” when it is occasionally used, most often refers to people from these groups. Like the Kurds among whom they live, these historically Christian groups have suffered from political violence. In the late 19th century Christians began to migrate to the West. This, combined with violence, political marginalization and a lower birth rate than the surrounding Muslim population, have resulted in a great decline in their numbers. These believers have come to Christ through various means. Many report having had a dream about Jesus or having read the Bible in secret before seeking out a believer who could explain the faith more fully to them. Others have responded to the witness of Christians. Still others have begun to follow Christ while living in a Western country, or moved to the West to escape persecution after coming to faith. As a result, there are now small Kurdish-speaking fellowships meeting in a number of countries, both in the Kurdistan region and in the West. In addition, since most Kurds speak the dominant language of the country in which they live, some are members of fellowships that that have mixed ethnic membership and use other languages such as Arabic or Turkish. In Turkey, the church has grown significantly in the past decade, attracting both Turks and Kurds. Kurdish believers now worship alongside Turks in several Turkish cities. The government’s secularist stance has not prevented members of these fellowships from undergoing persecution, but it has left breathing room, particularly in the legal system, for the church that might not otherwise have been there. Turkey’s bid to join the European Union is partly dependent on its demonstration that its citizens enjoy basic freedoms, including religious freedom. This too may lead to the church becoming higher-profile. In the mean-time, God is raising up a new generation of Kurdish and Turkish believers whose faith is refined through persecution. media, and sending Christians back to Iran. This is despite a degree of fear from Muslim Iranians that reaches even to the farthest reaches of the global Iranian community. Starting in the late 19th century, God prompted a number of believers to move to Kurdistan to proclaim the gospel to the people there. They started schools and hospitals. They worked with the historically Christian groups in hopes of reaching the Muslim Kurds. A number lost their lives, some violently. Although they labored faithfully, they saw few lasting fruits. But our God, who offers the free gift of salvation to all people, including Kurdish people, was not finished moving among the Kurds. In recent decades a new generation has been raised up to reach the Kurds. Believers from all over the world are again working among the Kurds in the various locations where Kurds live, sharing the good news with them. The New Testament has now been translated into Kurdish, and work continues on the Old Testament. The Jesus video exists in both major dialects of Kurdish and has been seen by thousands of Kurds. back to Kurdistan to tell her family and friends. An Iranian Kurdish woman was nearly killed for her faith, and fled to the West. There, despite lingering fear, she is slowly learning to trust and reach out to her own ethnic group. Dr. Saeed, a Kurdish medical doctor, trusted Christ and shared his faith boldly with numerous people. (His biography is included on the list below.) A Kurdish man in the United States became an evangelist, reaching other Kurds with the Gospel both in Kurdistan and in the United States. An American church recently commissioned a Kurdish couple who are now working full-time to reach their own people. The Kurdish church is growing, but there is still a vast amount of work to be done. If you are a Kurdish believer, be encouraged! Be bold! Share your faith! If you are a non-Kurdish believer with a call to reach out where God leads, pray about the Kurds. God might just be preparing the way for you to share the light with them! Mallouhi, Christine, Waging Peace on Islam. Downer’s Grove, IL: InterVarsity Press. 2002. Rasooli, Jay M. and Cady H. Allen, Dr. Sa’eed of Iran: Kurdish Physician to Princes and Peasants, Nobles and Nomads. Pasadena, CA: William Carey Library. 1983. This post originally appeared on urbana.org.